Here is a hypothesis I have about the suitability of the solution-focused approach: the more complex a problem is, the less effective a traditional problem focused approach to change works and the more appropriate the solution-focused approach is. Below, is a translation of part of an article I wrote about this with Louis Cauffman in 2003. By complex we don't mean complicated. Examples of things that can be very complicated and require great experitise to understand are how the motor of car works, how a legal document is structured and phrased, and how a financial statement is made. But these things aren't complex in the sense that is meant here. What I mean with a complex problem is a problem that takes place in a complex adaptive system (a CAS) and that is related to the complexity of the system. 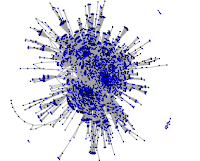 In a complex adaptive systems a large number of different types of agents interact with each other in various ways. An example of a CAS is a department in a large organization. Another example is the human brain. Complexity science has discovered that complex adaptive systems can, in certain aspects, behave remarkable and unpredictable. Within a CAS, for instance, there is a certain amount of self organization going on. Self organization means: the emergence of structures and patterns without deliberate top down direction or design. This self organizaing character of CAS (like the interactions between people in a large organization) brings with it certain surprising phenomena such as: 1) non-linear change: small events, actions and interactions, can lead to dramatic effects that can affect the whole system, 2) patterns and structures that repeat themselves within the system on different levels (fractal structures), and 3) the occurance of so-called emergent characterics, characteristics of the whole system which the seperate elements don't posses (take the human as an example: brain cells have no awareness, but the brain does). These phenomena together make it hard or even impossible to understand and predict events within a complex adaptive system, let alone to control them. 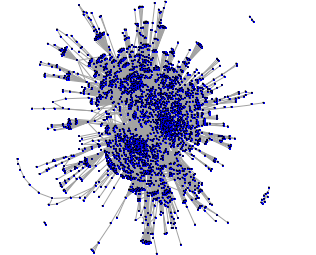 The findings of complexity science invites us to revise our traditional view on organizations in a few ways. Traditionally, we have viewed organizations rather mechanistically. 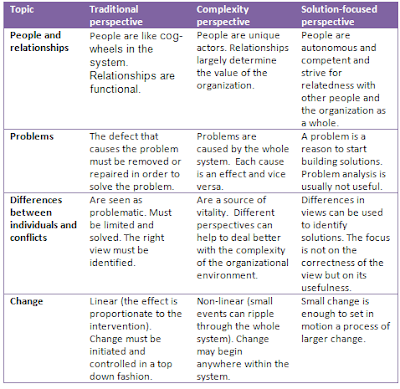 The table below contrasts the traditional perspective with the complexity perspective and with the solution-focused perspective. This table shows that the solution-focused approach and the complexity perspective fit well together. It is paradoxical: the complexity of behavior and organizations seems to ask for the simplicity of the solution-focused approach. Put differently: many problems in the way people and organizations function are complex problems which can best be dealt with in a solution-focused manner. I would like to expand a little bit on the People and Relationships. My view is heavily influenced but what I've read so far from Socionics. In Socionics, the relationship of 2 people with 2 personality types has a certain degree of prediction. Superficial relations might not be very influenced by this tendency to behave in a certain way BUT close relationships like that with a close coworker or that with a spouse, will amplify this tendency. Wouldn't understanding this tendency help in locating a better solution? What I'm asking is, aren't there exceptions from the rule? Hi Peter, that would certainly be one direction in which to do research. In SF, the focus is not on explaining and predicting so much. Each case, and each relationship is viewed as unique. Another approach that sees simplicity in complexity is Theory of Constraints. The best books on it are "The Choice" and "The Goal" both by Eliyahu Goldratt. These helped me grasp simplicity in complexity more than anything else.